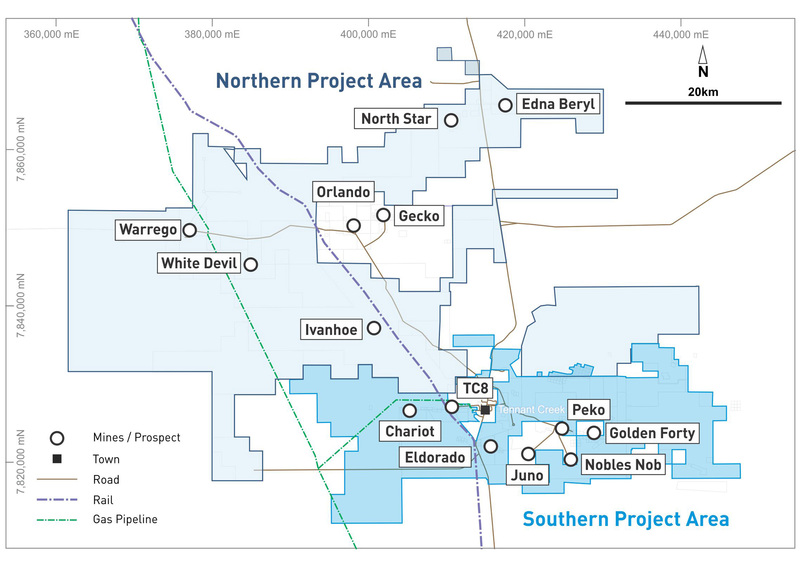 The Strategic Alliance between Emmerson and Territory Resources(TTY) is transformational for Emmerson (and the wider Tennant Creek Region) as for the first time for many decades, it delivers to our strategy of monetising stranded assets through developing an integrated, mining, processing and exploration hub. The Alliance provides a low risk pathway to commercial production from Emmerson’s portfolio of small mines and importantly, will generate funding for ongoing exploration programs in the Northern Territory and New South Wales. Funding by TTY of $5m for exploration within the SPA to earn a 75% equity interest (ERM the Managers and Operators). The A$5 million earn-in funding being provided by TTY over the Southern Project Area will further build the pipeline of mining projects to feed the new milling facility being constructed by TTY. Construction work on this important regional facility has commenced with first production scheduled for 2019. The Strategic Alliance consists of separate Exploration and Mining Joint Ventures over our Southern Project Area. As part of the Strategic Alliance, TTY has entered into an Earn-in and Joint Venture over Emmerson’s SPA. Historically, the southern area contains the highest gold endowment of the Tennant Creek Mineral Field and hosts the notable historical deposits of Nobles Nob, Juno, Peko and Eldorado. Under the terms of the earn-in, TTY will contribute A$5m over five years to earn a 75% equity interest in the SPA. After the earn-in phase, a Joint Venture can be formed whereby Emmerson can elect to either maintain its equity position in the SPA by contributing 25% to the exploration programs, dilute or convert to a royalty. During the earn-in, Emmerson is the operator and manager and will apply its systematic, science-based exploration that has been successful in other parts of the Tennant Creek Mineral Field. Emmerson is paid a management fee by TTY during the earn-in. Both parties will work collaboratively under an Exploration Management Committee that is aimed at identifying additional resources to feed the refurbished Warrego Mill. Emmerson and TTY have negotiated a Small Mines Joint Venture, consisting of a profit share and gold royalty agreement across its portfolio of small mines within the SPA. Mine planning and scheduling by TTY is well underway and contemplates concurrent mining from a number of both open cut and underground mines. Note: most of these projects do not have JORC compliant Resources (except Chariot) and are considered as Exploration Targets. The Chariot project has a JORC (2012) Indicated and Inferred Resource of 170,000 tonnes at a grade of 17.4g/t gold for 99,000oz, as per Table 2 (Refer to ASX announced on 28 November 2013). Emmerson confirms it is not aware of any new information or data that materially affects the information set out above or the material assumptions or technical parameters underpinning these estimates, which continue to apply and have not materially changed. The other projects are considered Exploration Targets and add a further 160,000 – 180,000oz of gold at an estimated grade of 15 – 20g/t gold (based on historical reports). This excludes any additional ounces added from the planned near mine exploration programs. These Exploration Targets are conceptual in nature. Whilst further drilling, metallurgy and mine optimisation studies are underway, these will not result in JORC resources estimates. Under the terms of the agreement with TTY, Emmerson will receive a non-diluting 25% profit share from any mine within the SPA, other than Edna Beryl and Chariot (where Emmerson will receive a 12% and 6% respectively of the gold produced). TTY will receive a 75% share of profits in exchange for undertaking the planning, funding, development and operation of the mines. At this stage, Emmerson’s portion of the profit share cannot be determined until the mining, processing, and recoveries can be better ascertained for each individual mining project.